General information: You’ll find the Bacchus in the heart of Newcastle city centre, where it was recently refurbished with a subtle grand ocean liner theme. Its walls are now lined with black and white images that affectionately look back to Tyneside’s ship building past, and it’s a fantastic place to learn about the history of one of the region’s biggest industries. It’s also a great place to stop off before or after a visit to the Theatre Royal which is on a neighbouring street, and it’s close to Monument Metro station and many other popular entertainment venues, too. Visit during the day, and you can take advantage of a varied and high-quality menu that includes snacks and quick lunches, and which perfectly complements the pub’s wide selection of cask ales, fantastic choice of microbrewery beers, and extensive wine list. And with a regular listing in the CAMRA Good Beer Guide, it’s easy to understand why this is one of the city’s most popular pubs. 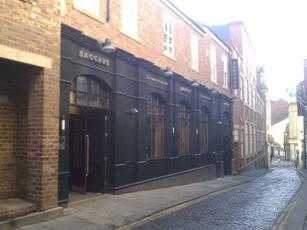 The Bacchus is still one of the best, if not the best pub in Newcastle city centre, in my opinion. It was quiet at around midnight on my midweek visit. I think we were the last out. But once again, there was a decent beer selection - Fyne Ales Jarl, Anarchy Blonde Star, Bandwagon All Smokey, Hadrian and Border Ouseburn Porter, Abbeydale Voyager IPA, Three Kings Canadien Gold, Flash House Table Beer, Errant The Passenger & Yorkshire Dales Askrigg Bitter. The cider was Thistly Cross Whisky Cask. A must visit. A slightly older clientele and the lights were too high in the mix, but decent enough in a beer lover pleasing sort of way - a Hazelnut milk stout was excellent but came at the end of a long day of imbibing so probably wasn't as enjoyed as much as it could have been. Extremely busy in midweek with mostly middle-aged clientele. At least 10 taps, mostly from microbreweries and a huge selection of world beers. Refreshing free of TVs or fruit machines and the music was not intrusive. Extremely clean bar area. The only downside as far as I'm concerned is that, although the seating is very comfortable, the place itself doesn't have a comfortable pub feel - it's much too big and impersonal for that. A special mention for the two young barstaff - a woman and a bespectacled bloke - despite the bar being mobbed, no one was kept waiting for long. They were superb. Don't usually go into pubs that require bouncers/heavies/security but this is a great place for ales. However on Good Friday it was so crowded and noisy to make being there uncomfortable. We enjoyed " Handrawn Monkey Porter" and Nottingham pale and both were good condition. There were a further 7 ales on of which 2 were a stout and a porter.